Stylish blogger Anni aka Fashion Hippie shows us how to work pastels in her post about her Angel Jackson Samaya Mini Box Bag in lilac. The lush snakeskin on our ever-popular Samaya can transform a simple outfit of t-shirt and shorts into a luxe look, perfect for Summer days. Our Samaya Mini bag comes in a kaleidoscope of colours; the deeply pigmented shades are guaranteed to brighten up your outfit and the mini bag even comes with a cute matching mirror: perfect for on the go. 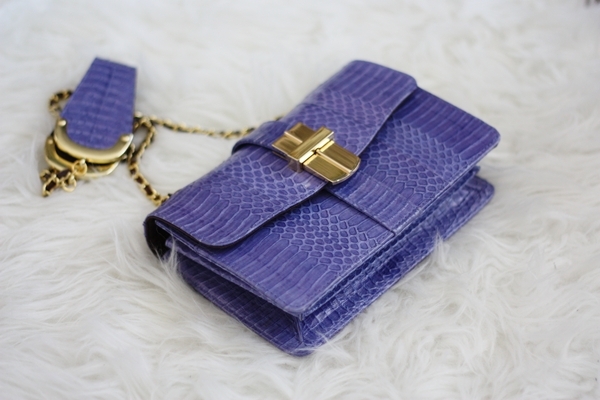 something about this little lilac handbag which we love too! perfect for summer parties! I love that color !!!! I want the same 😉 I’ve already purchase the yellow one in the Samaya collection, but I want this toooooo ! Had my eye on this one for a little while, hopefully should be able a get my hands on one soon. I love Angel Jackson bags!! love all the new colours! defo want one for the summer!!! big angel jackson fan!! These bags are so gorgeous! The foldover clutch is perfect for polished summer style.